A study group led by Dr. Yukari Ohta at Research and Development Center for Marine Biosciences, the Japan Agency for Marine-Earth Science and Technology (JAMSTEC: Asahiko Taira, President) found a method to produce phenylpropanone monomers from natural lignin isolated from wood by using multiple enzymes derived from a marine bacterial strain. This study project was carried out in collaboration with Takashi Watanabe at Kyoto University, Prof. Toshio Koizumi at National Defense Academy and Prof. Yuji Hatada at Saitama Institute of Technology. 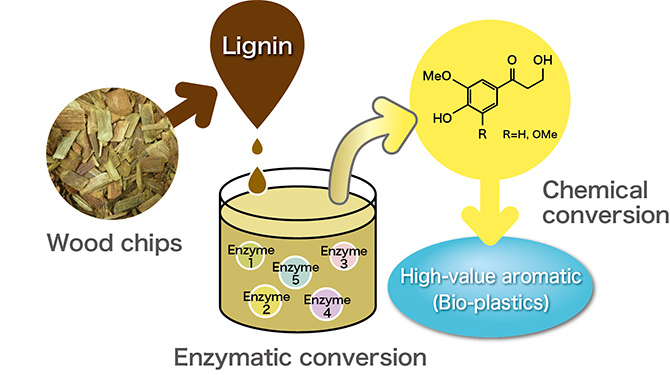 Lignin, a chemical compound often found in non-editable biomass, presents a potential to replace fossil resources. To reduce emission of greenhouse gases, many studies for biomass utilization as a renewable resources have been carried out. 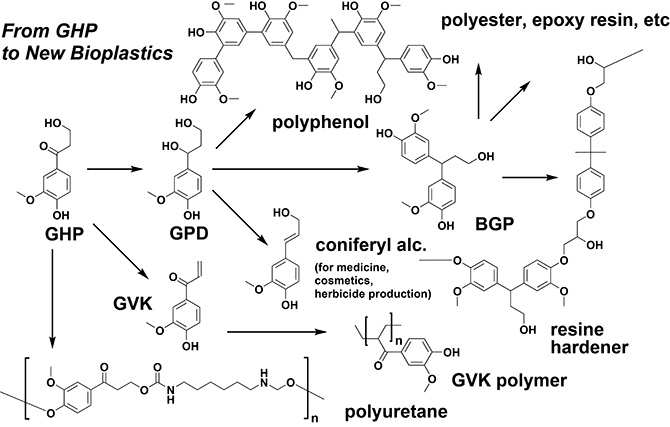 In addition to enzymatic production of phenylpropanone monomers from milled wood lignins, the study group successfully demonstrated a simple method of chemical conversions for the valorization of lignin-derived phenylpropanone monomers, which can be applied to produce bio-plastics and other functional chemicals such as medicines, functional foods and cosmetics. These results are expected to open up a new stream for white biotechnology using a living cells and/or their enzymes for industrial purposes. This work was supported by Advanced Low Carbon Technology Research and Development Program (ACLA) in JST Strategic Basic Research Programs, Mission Research by the Research Institute for Sustainable Humanosphere, Kyoto University, and by JSPS KAKENHI Grant Number JP15K00649. Figure 3. Schematic diagram of the chemical synthesis that yields functional chemicals from GHP, a key platform compound.